WASHINGTON -- In a show of American military might to North Korea, the United States on Saturday flew bombers and fighter escorts to the farthest point north of the Demilitarized Zone by any such American aircraft this century. The Pentagon said the mission showed how seriously President Trump takes North Korea's "reckless behavior." North Korea's leader, Kim Jong Un, has said Mr. Trump would "pay dearly" for threatening to "totally destroy" North Korea if the U.S. was forced to defend itself or its allies against a North Korean attack. Kim's foreign minister said at the U.N. Saturday that Mr. Trump's taunts make a strike on the U.S. mainland "inevitable." North Korea has said it intends to build a missile capable of striking all parts of the United States with a nuclear bomb. Mr. Trump has said he won't allow it, although the U.S. so far has not used military force to impede the North's progress. 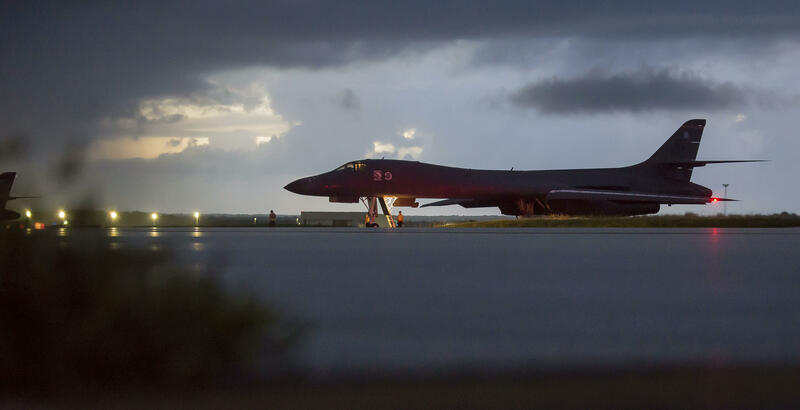 The Pentagon said B-1B bombers from Guam, along with F-15C Eagle fighter escorts from Okinawa, Japan, flew in international airspace over waters east of North Korea on Saturday. The U.S. characterized the flights as extending farther north of the DMZ, which separates North and South Korea, than any U.S. fighter or bomber had gone off the North Korean coast in the 21st century. Mr. Trump on Friday had renewed his rhetorical offensive against Kim. And in a Friday night rally in Alabama, Mr. Trump called Kim a "little rocket man," after the two traded barbs this week during the United Nations General Assembly. Mr. Trump said he would handle North Korea, but he also left the uncertain situation of its nuclear weapons capabilities up in the air, saying, "maybe something gets worked out, and maybe it doesn't." On Thursday, Mr. Trump announced more economic sanctions against the impoverished and isolated country, targeting foreign companies that deal with the North. "North Korea's nuclear weapons and missile development is a grave threat to peace and security in our world and it is unacceptable that others financially support this criminal, rogue regime," Mr. Trump said as he joined Japanese Prime Minister Shinzo Abe and South Korean President Moon Jae-in for a meeting in New York. Hours later, Kim responded by saying Mr. Trump was "deranged." In a speech last week at the United Nations, Mr. Trump had issued the warning of potential obliteration and mocked the North's young autocrat as a "Rocket Man" on a "suicide mission." Mr. Trump also said China was imposing major banking sanctions, too, but there was no immediate confirmation from the North's most important trading partner.